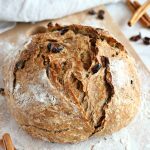 This Easy No Knead Cinnamon Raisin Artisan Bread is crusty on the outside, tender and fluffy on the inside and packed with sweet cinnamon flavour and juicy raisins. And it's so easy to make this bakery-style loaf at home in your own kitchen! Add the flours, raisins, yeast, salt, cinnamon, and brown sugar to a large bowl. Be sure to add the yeast and the salt to separate sides of the bowl. Stir the dry ingredients together well. Add the water and stir until a thick, rough dough forms. Add 1-2 more tablespoons of water or flour if needed. Flour your hands and shape the dough into a ball, placing it into the bottom of the bowl and covering the bowl with plastic wrap. Place in a warm spot in your kitchen and let rise for 12-18 hours. When I make this bread, I prepare the dough in the evening and bake the next morning. For quick rise instructions, see the Recipe Notes below. After the rising time, preheat your oven to 450 degrees Fahrenheit. Place an oven-safe Dutch Oven pot in the cold oven and let it preheat with the oven. Flour your hands well and shape the dough into a round ball and set it on a piece of parchment paper on the counter dusted with flour. Dust the top of the dough ball with flour and cover with a clean kitchen towel, letting it rise for 25 minutes. After the dough has risen remove the Dutch Oven pot from the oven and using the parchment paper, pick up the dough and place it carefully in the bottom of the Dutch Oven. Make two very shallow slices in the top of the risen loaf in the shape of an X. Replace the lid of the Dutch Oven, place it back into the hot oven, and bake for 30 minutes. After 30 minutes of baking time, remove the lid from the Dutch Oven and continue baking for an additional 10 minutes uncovered. After the baking time, remove the pot from the oven and transfer the loaf to a cooling rack using the parchment paper. Add 2 1/2 teaspoons of active dry yeast instead of the amount listed in the recipe. Rise for 2 hours and follow the recipe directions after the rise time as written.